With the Heavenly Sword Dragon Slaying Saber 倚天屠龙记 remake airing now, it's no surprise that Yukee Chen Yuqi (Ashes of Love) who plays Zhao Min in the series is getting attention. In a recent interview, she opens up about how she prepared for the role of one of the most popular wuxia heroines in the Condor Heroes trilogy. Yukee Chen shares that as part of her routine, she studied different versions of Zhao Min from other adaptations and would compare them to her character in the script. She says that before she took the role, Yukee thought of Zhao Min as a quirky character. She only realized when she signed on to play the high spirited Zhao Min that it was a difficult role and the pressure became all too real. Yukee Chen also says that she didn't have that many fight scenes. Zhao Min was a leader who had capable men that were well-versed in martial arts doing her bidding. Despite this, Yukee had martial arts training for a month as an added skillset. She had to train with martial arts instructors from 8 am to 5 pm daily and had to practice constantly. Since she came in a month early, all the martial arts instructors focused on her as there were no other actors present at the time. Because of this, Yukee jokingly says that she's now a martial arts expert. Yukee later reveals what was going on behind the scenes in the iconic scene where Zhang Wuji, played by Joseph Zheng, had to tickle Zhao Min's foot. Yukee, who naturally does not get ticklish said that she had to had to act like she was laughing despite feeling pain from keeping her leg raised. She had to practice laughing until her throat became dry so she had to gulp down water before filming again. Ultimately, Yukee's version will go down in history as one of the long line of actresses who have portrayed the character. Hopefully, her hard work and dedication shines through as she puts her own spin to it with her cute and down-to-earth personality. Yukee is very pretty and she resembles Alyssa Chia in a way. 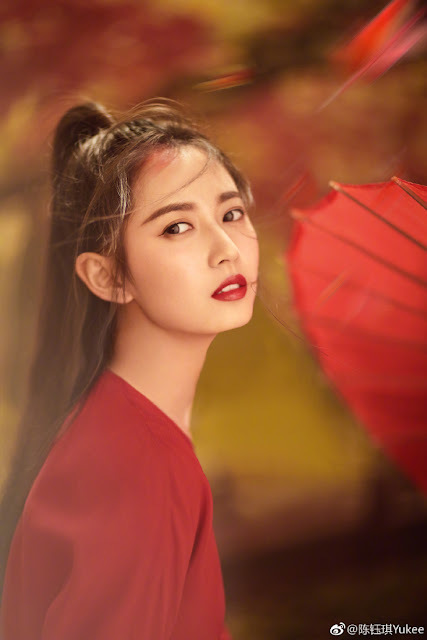 Unfornately many people hate her because she's under Tang Yan agency, I don't understand why that is even a reason to hate on somebody these days...let's use another example, such as how people also hate Diliraba for the fact she's under Yang Mi. It's really unreasonable hate but whatever. Also, Yukee starred in Ashes of Love where her story arc was boring and dumb half of the time and fans of Deng Lun and Yang Zi got really upset and unhappy about this actress. Actually unfortunately I ended up not liking her that much in Ashes of Love too. And even wished I didn't watch that drama before her HSDS drama came out because I was so looking forward to her since Princess Weiyoung days. But I'll try to watch HSDS without bias against her. Hopefully she has better roles in the future. I liked her character in AOL, but her story arc was boring tbh. Despite that, Yukee is very pretty. She's not too bad of an actress. Hopefully she'll gain more recognition as she continues to act in dramas. Hopefully people will be less hateful and learn to overlook such things. I liked her character in AOL too, but I agree her story arc was very boring. I don't mind some spotlight given to the secondary couple as long as their arc is interesting and engaging. She also lack chemistry with her love partner in AOL. However, I don't think it's her fault. The actor himself was a brick. I don't know if it's his character or what, but he was in Siege in Fog and he wasn't that bad. I liked her as an individual character, especially at the beginning but when her love interest appeared that's when she became this girl that chases after the boy constantly. Her sudden change in character is what bothered me the most. Look-wise, I don't think she's drop dead gorgeous, but she's pretty nevertheless. I haven't watch this version of HSDSS so I won't comment on her performance. I love Gigi portrayal of Zhao Min, actually I absolutely loved the 2001 TVB version so I've been avoiding this version lol. I totally agree with your comment about her character in AOL. She's a great actress that has the potential to become very successful in the future with more dramas! I like how she's so committed to her work O.O "Since she came in a month early, all the martial arts instructors focused on her as there were no other actors present at the time." thats dedication right there! Keep up the good work, i'll always be watching out for more of her dramas!